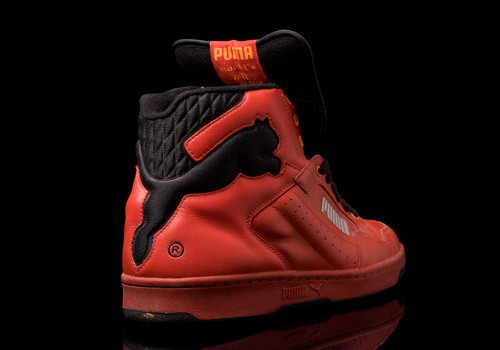 Solid red with black trim and splashes of orange and sliver, these high top PUMA Cat’s holler an old school flavor towards any modern day get-up as much as possible without the aid of geometric haircuts, neon colored overalls, or massive kitchen wall clocks clinging to likes of dookie neck chains. If you’re looking to seriously throw back but do so without getting apprehended by the 21ist century fashion police then look no further than 90′s Cat last. As Bobbito Garcia shares with us in his infamous book (“Where’d You Get Those?”) many pre-2000 – and much earlier, such as the ’70s and ’80s – basketball models were dropped in white uppers with a variety of colors splashed across them so that consumers could mix and match their shoes with their outfits. 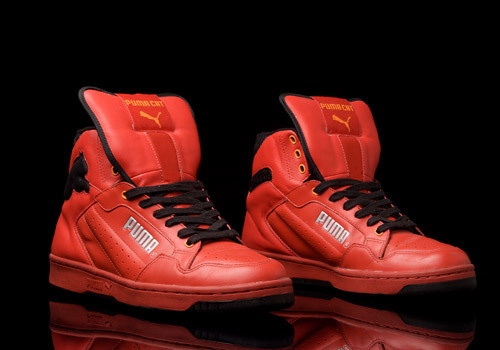 Now while others were playing simple painter, pushing single pigments against white leather canvases, PUMA was busy dropping the no-questions-asked, no-apologies-made, sincere, solid funk in every hue of the technicolor rainbow. 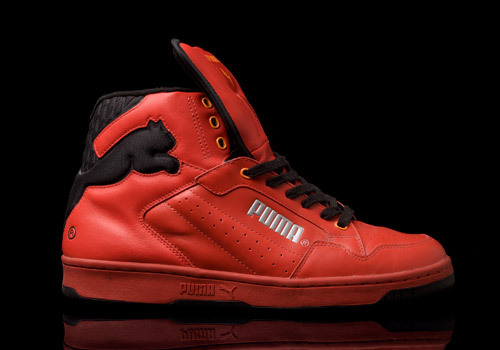 It really seems that everytime I look up I’m finding another colorway of the PUMA Cat high top silhouette, even with the more modern Japanese-only releases of the Cat 2 ST (which, by the way, was dropped in a fantastically tasty purple and yellow colorway, far too reminiscent of Batman to ignore). 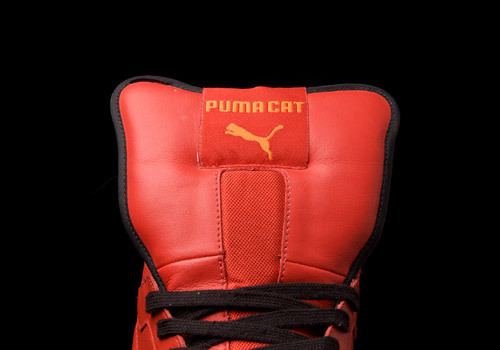 That being said, it’s important to realize that the red pair pictured here is from 2004, and not from the time that Bobbito aims to cover in his blessed book. 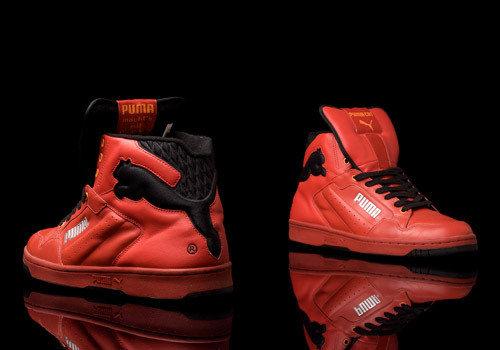 However this remake still stands to show Rudolf’s desire to be different, and bares the common benefits of most PUMA Cat’s; a solid, weight-bearing toe box, followed by a puffy, comfortable, super-wide tongue, and of course, lastly but most importantly, the immediately recognizable, textile cat leaping across the extremely supportive heel and ankle area. One detail on this version that does set it apart from others previously released is the puffed up ventilation strips running diagonal up the side walls, presumably added for both structural support and overall comfort. A final design detail also worth mentioning is the subtle, yet quite visible hits of orange coloring in the top and bottom metal eyelets, placed with intent to match the cat coloring on the front and back of the tongue. 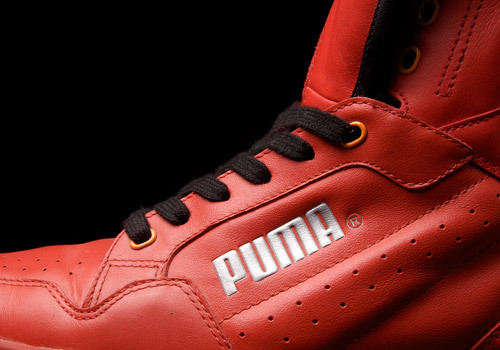 These kicks are definitely a sign that PUMA isn’t – and never was – lost in the trainer race, albeit at some times they honorable get stuck with the underdog title. 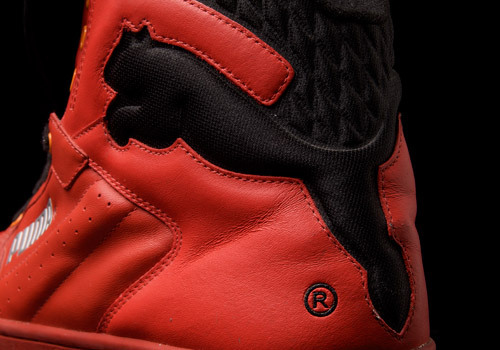 Like the embroidered R on the heel, never seen that before. Hey Guido, these came out in 2004 so they are not available in stores anymore. You’ll have to hunt the web as well as vintage and used sneaker shops to find them. Hope that helps!